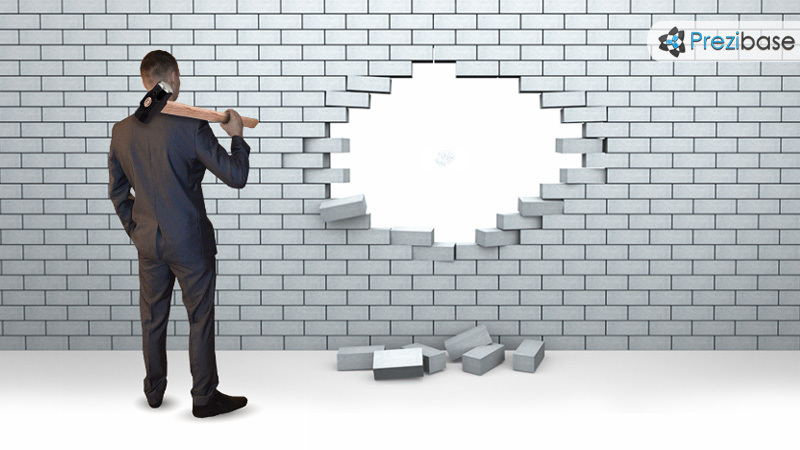 Prezi Presentation Template with a breakthrough concept – businessman with a sledgehammer breaking through brick a wall. Show how to achieve success and the necessary steps to get there. Zoom through the hole in the wall and reveal a sky background with bubbles and clouds. Present a business plan or show how to overcome great obstacles or solve big problems. Talk about great achievements, achieving success, demolition, bankruptcy. This entry was posted in Best Prezi presentation templates and tagged angry businessman, break, breakthrough, brick wall, brick wall hole, bubbles, businessman, businessman with hammer, clouds, demolition, fly, flying, great escape, hammer, hammer businessman, hammering, hole in wall, light, plan, prezi template, prezi templates, problem, sledgehammer, strong, succeed, success, vision, wall.